Men's and Women's team after the meet was over. 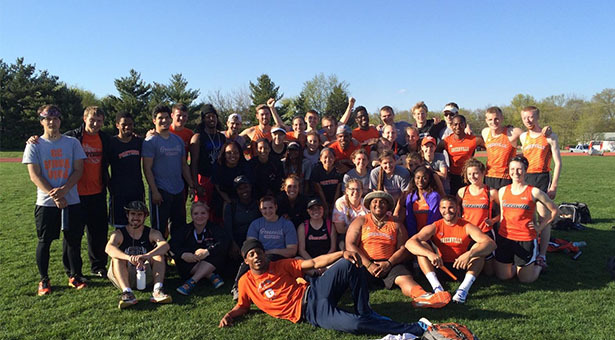 The Greenville College Track and Field team had great efforts at the Greenville Selection Invitational this past weekend in the squad’s first home meet of the season. 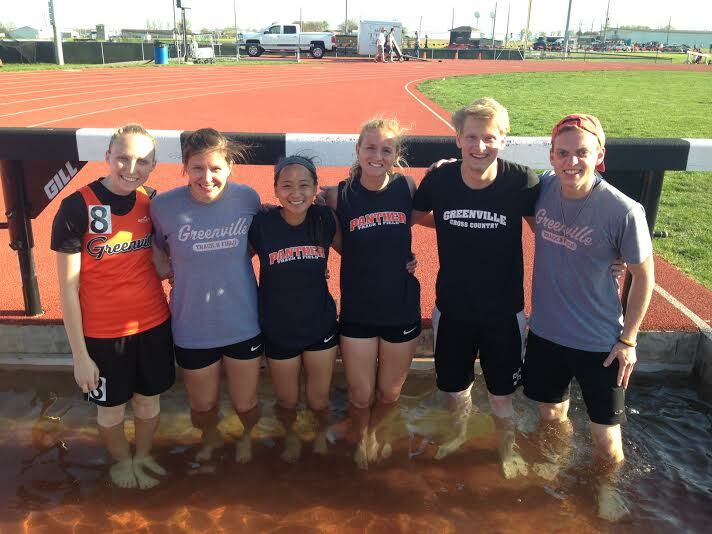 GC took advantage of the perfect weather to have a few more athletes qualify for Christian Nationals and have several others turn in new personal records. Treyvon Manning was able to get a few new personal records in the high jump and the 400 meter hurdles. His new high jump mark is now 6’6” and he completed the 400 hurdles in 56.05, which is good enough for a fifth place ranking in Christian Nationals. Manning also was able to help out his teammates in the 4×100 relay, which sped around the track in 42.98, ranking them ninth for Christian Nationals. Bradly Stubbs, Jarrid Williams, and Hamid Camera were also a part of that successful relay team on Saturday. Andrew Sharp was “Mr. Flash” in the last 200 meters of the 1500 meter race, as he came out on top for a first place finish. Sharp qualified for Christian Nationals in the 1500 with a time of 3:59.18, good enough for the sixth spot in the current Christian National rankings. Sharp also was a part of the 4×400 relay team who rallied in the last lap to finish second in a time of 3:22.3. His teammates on this relay included Nathan Potts, Matt Hughes, and Manning. Jaylen Shelton was able to qualify for Christian Nationals in the 800 meter run with a time of 1:58.09. He was able to sneak by John Mangold at the end of the race as Mangold ran 1:58.6. Potts also had a very fast finish in the 800 and won the race in a time of 1:56.5. Jarrid Williams had an amazing day in the long jump and 200 meter dash. 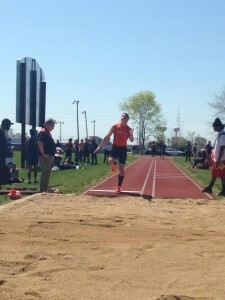 He has qualified in both events for Christian Nationals, along with triple jump. Williams ranks ninth in the long jump with a jump of 22’0.75”, and third in the triple with a jump of 45’5.75.” He has a time of 22.5 in the 200 meter dash. Greenville had outstanding throws on the day in the shot put, hammer, and discus. Mitchel Hooten threw for 48’1.75,” a mark that puts him first for the shot put in Christian Nationals. In the discus he ranks twelfth with a throw of 139’9”. The Women’s team had a pretty successful day as well. Chelsea Gilles ran her fastest 400 meter dash ever and ranks second in Nationals. She came away with a time of 55.9, while in the 200 meter dash she sped 25.58 and qualified her for Nationals. Josie Muniania and Alex Gregory were lightning fast in the 100 meter dash and were able to qualify for Christian Nationals, too. Muniania ran to a time of 12.94, while Gregory was close behind at 13.11. 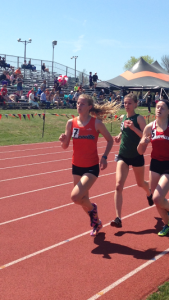 Brooke Goodyear was able to qualify for Nationals in the 1500 meter race with a time of 4:55.2, which is only one second off her personal best. Sierah Ruffner was dominant in the field events. She was able to get a new personal record of 5’1.75” in the high jump and with that great mark she qualified for Nationals. 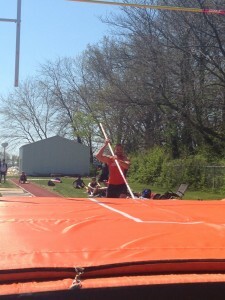 She also qualified in javelin with a mark of 97’7”. The field events had more success on the day with Rachel Hanna clearing 10 feet in pole vault and added to GC’s list of Christian National qualifiers. In the long jump Janisha Pealer finished second and leaped 17’3.25” across the sand. She became yet another National qualifier. Ellen Neese and Marideth Tate qualified for Christian Nationals in the shot put and hammer as well. Greenville showed up and showed out on Saturday. The team hopes to have more success as they will travel to Rose-Hulman University next Friday. Good job! your picture of Wlsman ( spelling?) is too far away to see much.